And it's guarded by that Ninja Killer Blackbird too, darn it! Anybody own MY PRETTY PONY S/L and can look at my lastest purchase. MY PRETTY PONY. I can text you pictures if you PM your cell phone #. When I open the metal cover, it looks like page separation from the Cover and the first page. Not sure what it supposed to look like. I will eventually get my wife to post pictures here, but I wanted to get back to the seller sooner than later. Does anyone know if Justin Brooks will ever update the 2013 edition of his bibliography? He updates it for himself, so the question is whether or not it will be publicly released at some point. I'm sure we will get an updated electronic version soon. I hope you’re right Alan. I am not adding anything worth mentioning to my collection these days but I use his book to keep tabs on what I have and what I’d like to look for in the future (when I’m done paying tuition fees and buying textbooks). I think it is up to us collectors to let him now we want an updated version. If there is no demand, he will not bother. Justin, my Kindle is waiting! What do you guys think of the Glenn Chadbourne cover/remarque series from Overlook? Was considering getting one for 'It'. If you like it buy it. Glenn Chadbourne tends to be a bit "Marmite". Love him or hate him. No inbetween. I think some of the covers are pretty cool and I have a few. I believe he'll do the Remarque of your choice as well but, you could cut out the middle man and send the book directly to him for the Remarque. Duh! Must be my browser, yes it works now. Good little score of a first signed IT and as comfortable as I feel in signatures I wanted my friends here to weigh in... JUST to be sure. Thoughts on signature? Signature looks fine to me; more than fine: love it! Signature looks good but see if there’s pressure/indentation marks on the paper, suggesting a pen rather than stamp... look at the rear of the page. Great signature. I wouldn't turn it away from Room 217. Look at the Viking logo print, and the Viking ship. They are not grainy, yet the signature is. A free flowing ink pen signature does not look grainy (Except under extreme magnification). I would need to examine the book in person, but I don't feel comfortable with what I see. 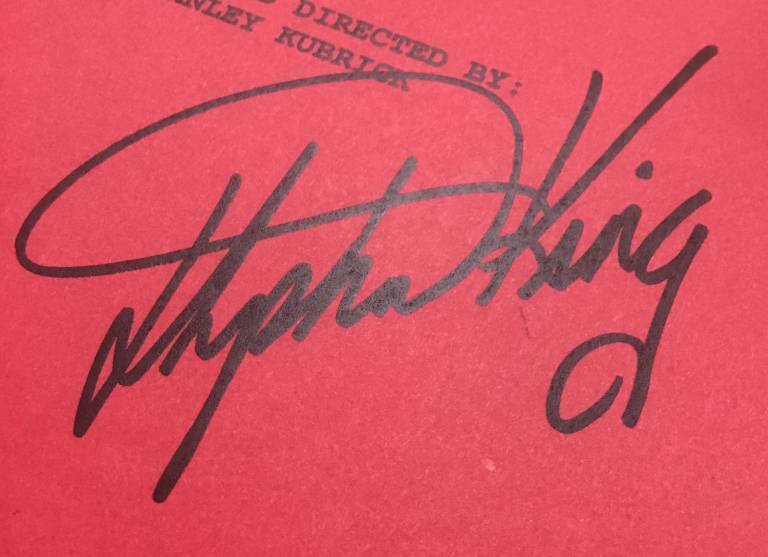 Whoa that’s Jack Nicholson’s sig too! If those are real that’s one cool collectible. 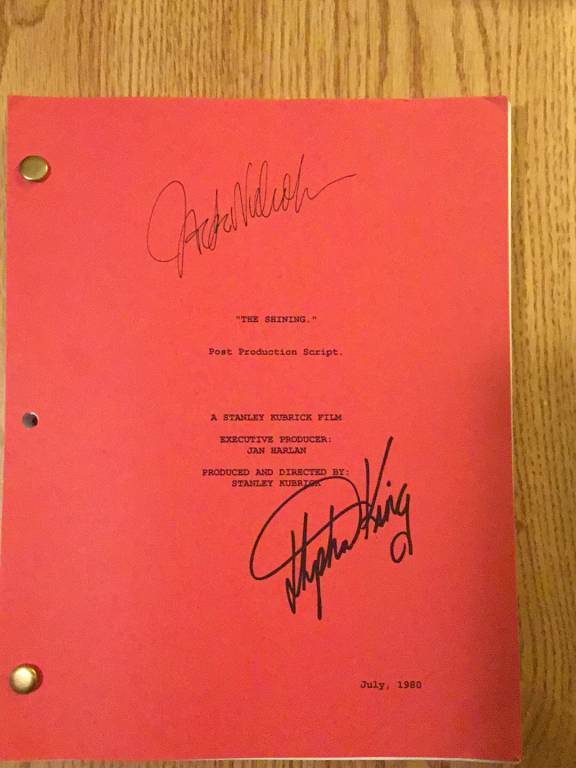 A high percentage of signed scripts turn out to be fake. That alone would make me approach with caution. Plus Kings feelings about the movie are well documented, which makes it further suspect. Even if i put all that aside, 'King' looks off to me and i would not want it in my collection. I said on FB I didn't like it. To elaborate, it looks like the fake ones that are known to be autopen. Not even close to how a script for that film looked like. Doesn't even have a production company on it and they produce the scripts. 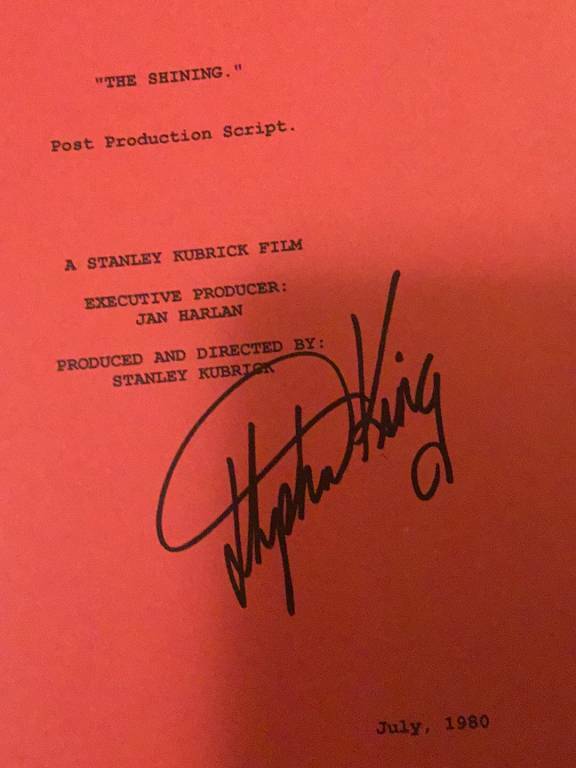 King hated Kubrick's version so bad, he made his own, from his own script, so I don't think he would ever sign a Kubrick one.